About 2 months back my friends and I went out to town for lunch, then popped by a café for a drink. As the weather was sweltering hot, we all ordered the cold-brewed coffee and it was soo good in the heat. However, the coffee came at an extremely hefty price tag, at about SGD 7 for one cup, which was eyeball-dropping expensive for me. 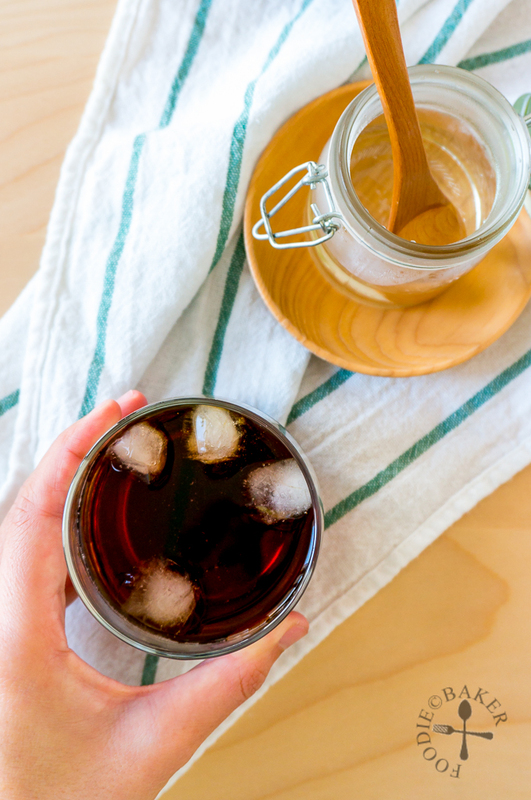 So I decided to try my hand at making the cold-brewed coffee myself at home – and it was so ridiculously easy that I have no idea why I didn’t make it earlier! 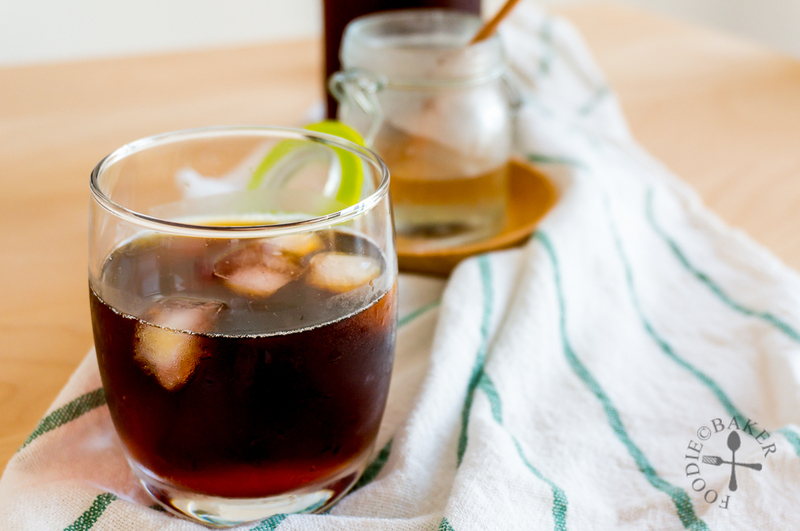 What makes cold-brewed coffee so special? Instead of subjecting ground coffee beans to boiling water, the ground coffee beans are steeped in cold or room temperature for a long period of time, usually 12 to 18 hours. This results in a coffee that has a lower acidity level, making it smoother and naturally sweeter (i.e. less bitter). My friend who only drinks mocha was surprised by the taste of the cold-brewed coffee and in fact like it after trying it! 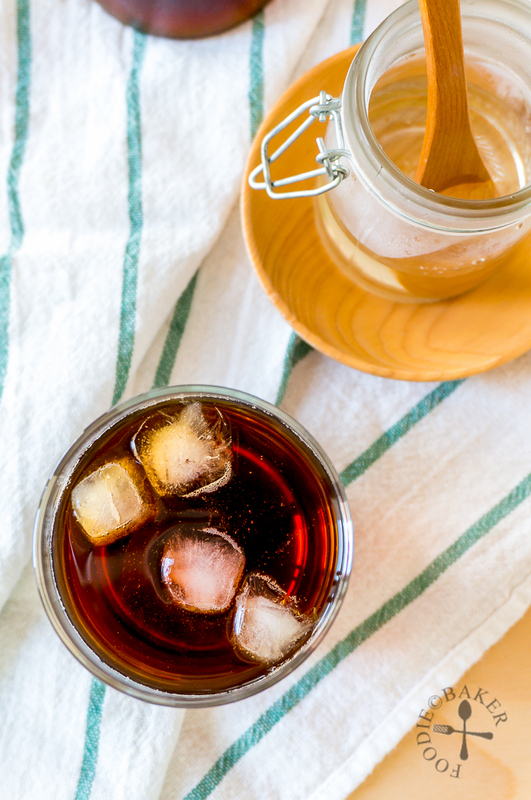 To make cold-brewed coffee, all you need are ground coffee beans, and cold or room temperature water. Oh, and also time. That’s it! I used the ground coffee beans that I bought back from Turkey (not for Turkish coffee, just regular ground coffee). The ground coffee beans were steeped in my French press which conveniently holds 1 litre of water, then covered and set aside in the refrigerator overnight for 12 hours. I like to make the coffee the night before, like after dinner, so I can have it for brunch/lunch the next day. You can vary the strength of your coffee by the amount of ground coffee beans, but I like to make it a bit stronger, so all I need is to add ice if I find it too strong. 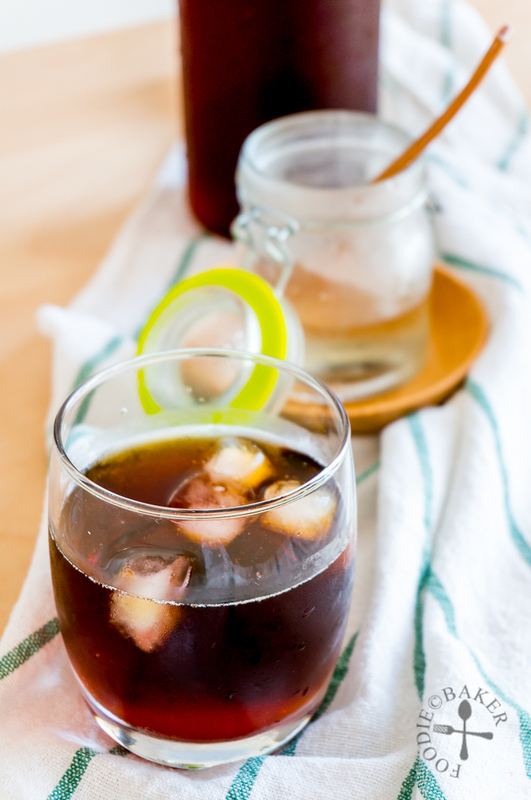 Milk and sugar syrup can be served with the cold-brewed coffee but most of the time, I like it as it is – plain and black. Here are the step-by-step photos but really, it’s so easy that I don’t think you’ll need them! Place coffee beans in a large jar (I used my French press), and pour in the water. 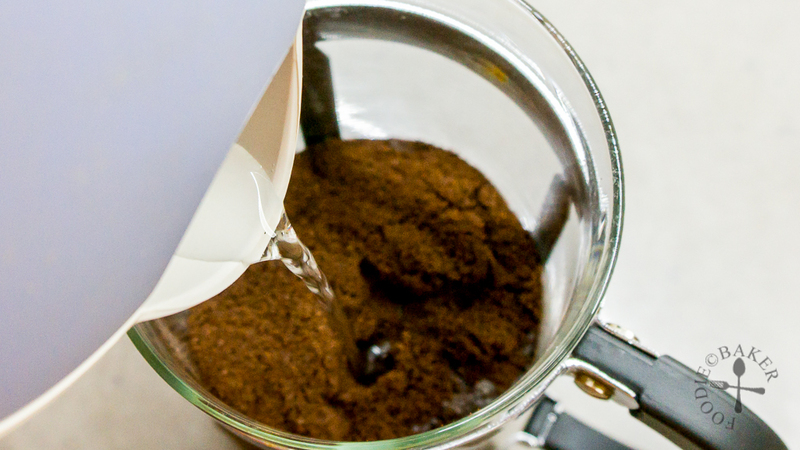 Stir with a long spoon or a chopstick until the coffee beans are moistened. Cover (don’t press it down yet), and steep in the refrigerator overnight for 12 to 18 hours. If using a French press, press the plunger down slowly. 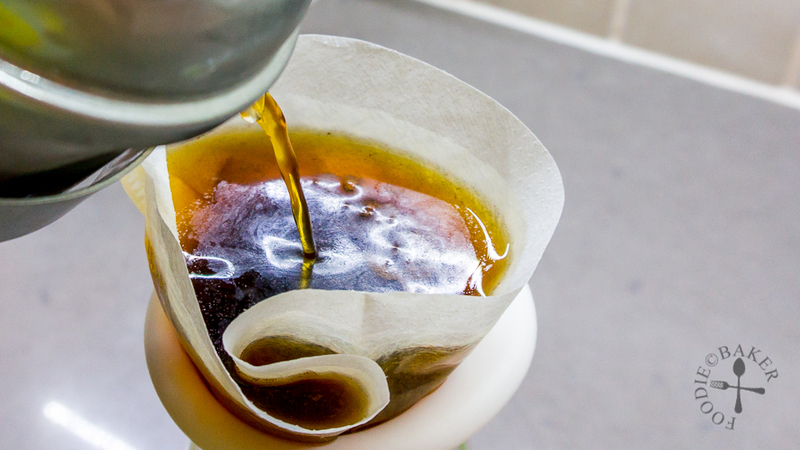 Pour the coffee through a paper filter / cheesecloth into a container. Serve with ice, sugar syrup, or milk if desired. Place coffee beans in a large jar (I used my French press), and pour in the water. Stir with a long spoon or a chopstick until the coffee beans are moistened. Cover (don't press it down yet), and steep in the refrigerator overnight for 12 to 18 hours. - To make the sugar syrup, dissolve ¼ cup of sugar in ¼ cup of water (microwave or heat it up to help the sugar dissolve better). I’ve not sampled ice coffee because of the price, Jasline. It’s coffee, for heaven’s sake! I will try your recipe though, Sounds good! How much there? Wow wee–in the States its the same price hot or cold? About $2.00. Wowwww that’s really cheap! If it’s that cheap where I’m living now, I’ll probably be drinking one everyday!